Yesterday’s straight empty road on the Canal embankment stretches ahead of us on the next day as well, once we had left the petrochemical factories at the outskirts of Gaoyou behind. To our left is the Canal with the barges, to our right – ponds, villages, patches of blooming rapeseed, gardens and grave mounds, half-screened by trees. Smaller channels branch out to bring water into the fields and to regulate flooding, and steep side-roads lead down into the villages. 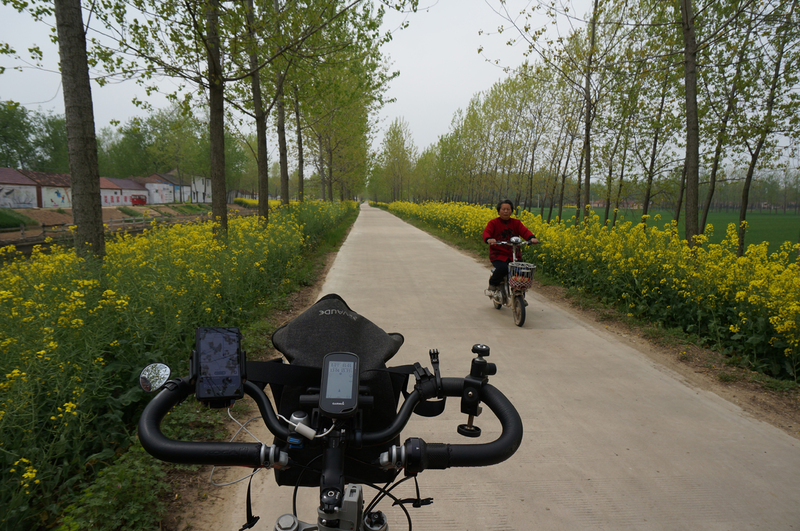 Although the road offers the perfect biking conditions (except the steady head-wind), we won’t find here any shops or noodle places for our break. So, we turn into a bigger village, and stop at the first supermarket. I go inside with the kids, while Volker decides to stay outside. Shortly after he bursts in: “Let’s go! Quickly!”. I left all goodies at the cashier and rush outside to find a crowd pushing forward round our unstable bike, almost toppling it down. Few of the men reek of alcohol, and uncontrollably laugh. We fled to another supermarket further away. Another crowd gathers. 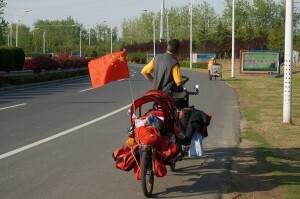 We have already got used to the interest of the local people in the foreign family travelling by unseen bike construction. But with the first question being “How much does this bike cost?” instead of the usual “Where do you come from” “For how long have you being biking”, etc., the attitude is already different from the usual good-humoured curiosity. Sarah and Nora cling in fright to my legs, forgetting their melting ice-creams. We fled the village for good, and had a picnic at the roadside instead: cut a melon, made instant coffee with mineral water and munched on crackers and cookies while watching the barges on the canal. In the distance few villagers are mowing the narrow strip of grass along the deserted road. 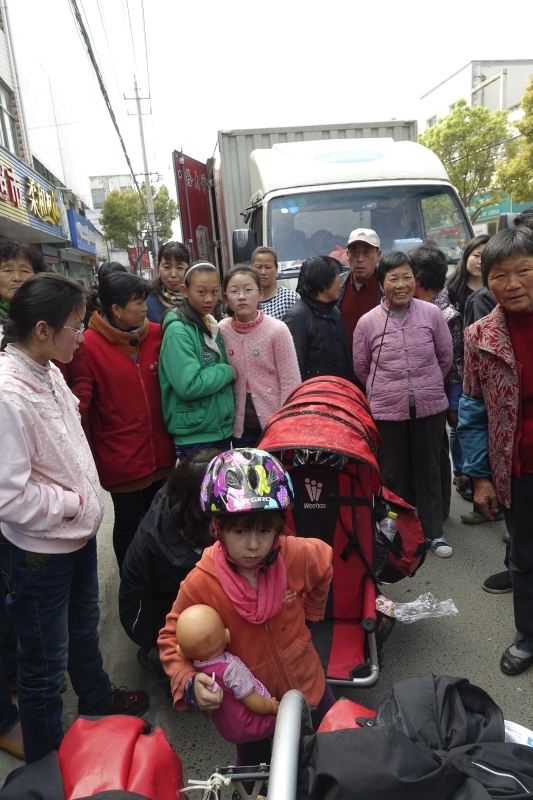 We reflected why was the atmosphere in this village so different from what we have encountered until now in Jiangsu. Could the name of the village: Xinmin, New People,- possibly indicate that its inhabitants have been resettled from somewhere else? One kilometre later we pass by a perfect resting place – a Chinese pavilion beside the road, offering wonderful view over the surviving old part of a town called Fanshui. I longingly look at the narrow lanes and old rooftops – too late, our rest time has already been exhausted. The monotony of the straight road is later somewhat broken by a Buddhist figures workshop that suddenly appears out of nowhere, and exhibits wooden statues of various sizes and in various stage of completeness. While Nora naps cosily in her seat, Sarah is leading imaginary dialogues with the Laughing Buddha and several arhats. After 70 km we reach the town of Baoying, and as usual are welcomed by an endless array of scaffolded monoliths in the newly developed outskirts. We pass by electrical factories and software companies – a possible source of Baoying’s new affluence. Our dinner is in a small restaurant, named “Red Star”, under a big red star and revolutionary posters on the wall. Instead of a menu, one can choose among several dishes of the day. “You eat what we have”, says the boss laconically in the truest spirit of a communal kitchen. But the dishes offered taste much, much better. The boss is curious what brings us to Baoying. “There is nothing of interest here! Have you been to Yangzhou? Yangzhou, there it is beautiful”, she wistfully sighs and moves to the other tables. The next morning welcomes us with drizzling rain. “It rains!”- I shout as we come out of the hotel. “That’s no rain!”- declares Volker, for once being the optimist in the family,- “It’s a small drizzle, and it already clears up”. No excuses for not biking today. The rain-trousers of the kids are found in the depths of the bags and up the saddles we go. The perfect Canal road seems to offer nothing new, and we take a detour through the villages instead. Narrow roads lead us among the green fields with what we tentatively identify as barley. The green expanse is broken by small shrines housing the god of locality and by scattered clusters of grave mounds. It is only 2 weeks since the Tomb-sweeping day, and the unmarked mounds of earth are still decorated with bright artificial flowers. The quiet landscape, shrouded in mist, seems taken out of time. A small village restaurant gives us a shelter from the drizzle and a hearty, though simple meal. We leave laden by a gift of bulgy bag of deep-fried dough strips (the local specialty, as we are told). Somehow we managed to attach it to the other bags at the back of the trailer. While our vehicle still boasts a high-tech front, from the rear it looks more and more like a gypsy wagon. And back to our old Canal road we go. Suddenly music is heard ahead of us and from behind a pile of gravel there appears a procession of mourners – in white caps and flowing white draperies, carrying offerings. They are accompanied not by the usual piercing tunes of the suona, but by a brass band. Huai’an is a huge spread-out conglomerate of four towns that lie at the convergence of River Huai with the Hongze lake – the fourth biggest lake in China. Few other major rivers also flow here and the region has been always prone to multiple floods Allegedly the Chinese mythical hero Yu the Great who tamed the Big Flood, did much of his water-control work on River Huai. Nowadays, 4 millenniums later, the waters are tamed for good, and we pass numerous water-regulation sites and cross countless channels that drain the excessive waters towards the east. 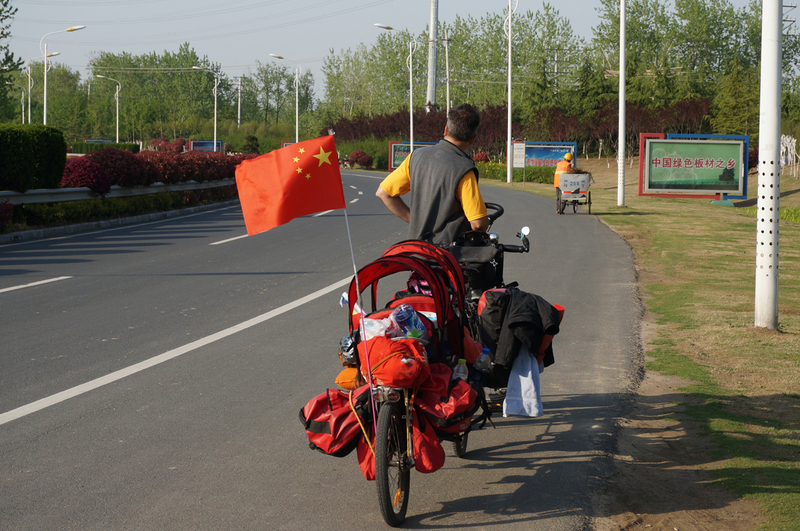 We have decided to skip the city centre and remain instead in the southern part Chuzhou, where most places of interest are. Huai’an was the old home of the former Chinese premier Zhou Enlai, and the prime tourist attractions here are his old residence and a huge memorial hall. Chuzhou greets us with the usual newly built multi-storeyed complexes, however, the major street close to the memorial hall is still under construction. It seems that in a year or so there will be a tram going to the memorial hall, among nice shrubbery and trees; we have simply arrived too early, amidst the mud and mess. As we approach our hotel, it starts to downpour – the Rainmaker has come to town!